Kimcheelicious: Inside the "The Outside In"
The Hudson Valley has called me and I must go. I’m preparing for a culinary journey—a tasting event called The Outside In Piermont Artisanal Food Bazaar in Piermont, NY. I’m very excited and honored to be one of the18 participating vendors at this taste-and-buy event. Although 12 jars of vegan Napa cabbage kimchee are currently in second fermentation, they are slated for dehydration to make my Hanguk Saffron. Modeled after the successful Smorgasburg at the Brooklyn Flea, the intent of this event is to grow the businesses of aspiring food craft entrepreneurs by providing a compelling and unique venue to test new dishes, receive customer feedback and build a following. 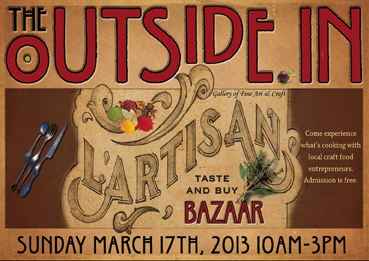 The OUTSIDE IN’s Artisan Food Bazaar will feature a diverse locally sourced selection of savory and sweet items for consumers including artisan and gluten free baked goods, craft beer, brewing supplies, organic spices, charcuterie, Peruvian tapas, crafted cheeses, unfiltered olive oil, soups, chicken pot pies, kimchee biscuits, small batch granola, handmade donuts, honey, fruit leathers, jams, micro-roast coffee and a mixologist created drink unique for the event called The “Bottom’s Up” Punch. Line up peeps, Admission is free. I’ll have Nappa cabbage and fermented radish kimchee on hand for tasting along with my mini buttermilk kimchee biscuits. Project organizer Bill Walsh personally requested my biscuits as one of the items at my tasting table but the jewel in this crown is my Hnaguk Saffron, a powdered kimchee seasoning made from a blend of dehydrated kimchee, milled into a fine powder. I use it in baking and in pan fried foods. A local chef in Prospect Heights uses it in his salmon tartar. He calls it his magic bullet. Personally I use it in my baked goods, pan-seared dishes, dry rubs, soups and stews. Maybe investing in 1,000 foil packets wasn’t such a bad idea?